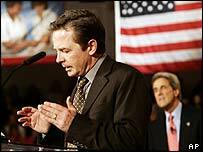 Actor Michael J Fox is returning to television in the US to appear in an advert backing Democrat John Kerry's presidential campaign. The actor, who has Parkinson's disease, is shown praising Mr Kerry for his backing of stem cell research. "John Kerry strongly supports stem cell research. George Bush is putting limits on it," Fox is seen saying. The Spin City star, who left the series in 2000, appeared with the candidate in New Hampshire on Monday. Fox is among campaigners, including Superman star Christopher Reeve, who believe stem cell research could lead to a cure for diseases like Parkinson's. Three years ago, President Bush limited federal funding of embryonic stem cell research to the 78 stem cell lines in existence. Some religious groups are against an increase in the harvest of stem cells from embryos because they say it is abortion. Fox's advert will run in states considered to be close. The Bush campaign dismissed the advert. "George Bush is the first president to allow for the federal funding of embryonic stem cell research and has provided hundreds of millions of federal dollars for stem cell research," said Brian Jones, a Bush spokesman. Fox made his name with the Back to the Future film series. His illness forced his early retirement from leading roles at the height of Spin City's success.